The adt-audio BC3 is a system of analog on air consoles, suitable for small to medium sized Radio and Television stations, production facilites, Theatres, Live sound applications and edit rooms. The combination of excellent sonic and build quality, extremely low failure rate and long lifespan, results in a range of audio broadcast consoles that offer excellent reliability and performance and still excel in any operating condition. A multiplicity of module versions and features, easy upgradeability and an incredible price/performance ratio, justifies the investment of ownership. It is possible to construct compact consoles with up to 64 input channels, 16 groups and 10 sends as well as very small rack mounted versions. Special modules are produced with functions important for radio and television operations. Moreover, extensive PFL functions with different modes of operation, red light and fader start control with numerous configuration possibilities as well as n-minus outputs in every module. The telephone module row make possible, in addition, the accessibility and remote control of telephone hybrids and ISDN lines including internal communication circuits for direct telephone connection. All modules are 100% interchangeable and will fit into any slot on the console. The module pallet consists of mono and stereo input channels, telephone channels in mono and line channels for the integration of ISDN lines (stereo Telco), as well as mono and stereo group channels, master units, source and monitor selection and a command module. All input and group modules can be supplied with different processing sections. Mono input channels are available with a simple 4 band sweep EQ with high pass filter, or it could be supplied with adjustable high pass and low pass filters, a 4 band EQ with 2 fully parametric mid bands and selectable high and low shelving filters, and a combined compressor/ expander. All modules can be implemented with either 100 mm or with 128 mm Penny and Giles faders. With appropriate module choice BC3 mixers can be produced according to rulebook IRT 3/5 standards. For the simple integration of the BC3 consoles in digital systems there are input and output's channels with A/D/A converters integrated directly in the module. These devices will convert from analog to AES-EBU3. 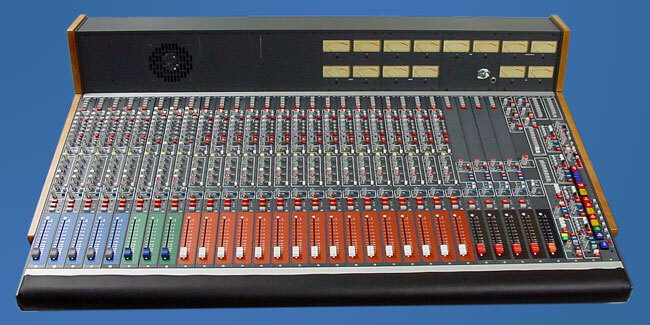 The BC3 series analog Consoles are assembled using a grid of 4 module-wide (160 mms) subdivisions. In addition, a 19-inch frame is available for the installation into standard 19-inch racks with 10 module places (for a 8X2 mixer with a control room module). All the input channels are mechanically compatible therefore; there is only one standard frame for input channels. Input modules can be mixed and matched to create any desirable configuration. All group, maste, and control room units are likewise compatible and can be inserted into any position within the respective frame. The frame slots for the master section are specially wired for these module types and are not compatible with the input channels. 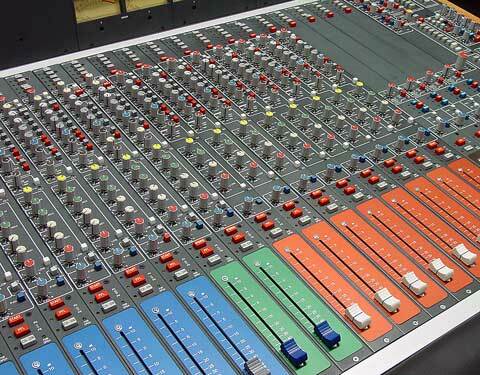 Additionally, writing surfaces, producer's area, surfaces for keyboards and patch bays can all be easily integrated into the broadcast consoles frame. 2 different types of power supplies, providing different power levels are available. An optional crossover unit and second power supply will provide redundancy. 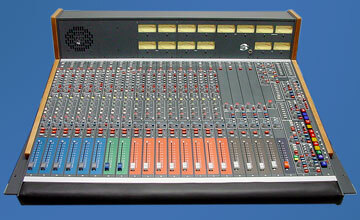 Like the rest of these compact analog broadcast consoles, the meter bridge is also modular. Different types of display systems can be used. VU meters and RTW peakmeters, adt-audio Peakmeters with 30 LEDS per channel are available in mono and stereo versions. Furthermore, a PFL loudspeaker, timecode displays or other signal devices can also be built into the meterbridge. A host of other module versions exist for this system, making it suitable for other applications. Because of its compact construction, the BC3 is suitable for mobile duty in recording and outside broadcasts vans, theaters and live sound reinforcement. In addition to the standard modules, custom, or modified versions can als be produced.